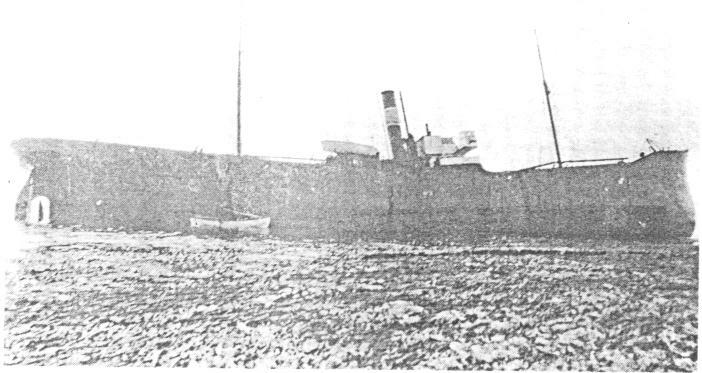 This Finnish steamer of Helsingfors, stranded on Langaton Rock, Stroma, during dense fog at 6am while on passage from Manchester to Helsingfors in ballast. A Stroma fishing boat the Evelyn, had set off for the creels towing a skiff, the Mary, which was used for going in close to the rocks to set the creels. When they got to the Gertrud the fishermen found that there were three women aboard, which was quite common in those days on foreign ships. The women and some of the crew were put into the Mary and set off rowing for the Geo in the North End, whereafter they were looked after by the lighthouse keepers wives. The Thurso and Longhope lifeboats were in attendance. As the Gertrud ebbed, more of the crew climbed ashore on to the rocks and the rest were taken to the Geo. Later that day the 23 survivors were taken to Huna to start the long journey home. The women regarded the Gertrud as their home and were very upset when she broke up and sank. The vessel's back was broken, a large fracture appearing in her hull amidships and with an increasing swell coming in with the flood tide she was within twenty four hours swept over the reef to sink in deep water. It was said that her captain failed to hear Dunnet Head fog horn so he went back until he heard the blasts and adjusted his course, which unfortunately ended with the stranding. On 2 June 1934 a boats crew picked up one of the vessels lifeboats off Brough and when she sank boats from the North end harbour retrieved timber and fittings which came round past Swelkie point on the flood tide. On 19 September 1934 at a public auction at Wick Custom House the following items from the Gertrud were sold; new manilla ropes, warps, canvas, cabin fittings, oils, paints, sugar, rice and soap. The Stroma fishermen involved in the rescue received a citation from the Coastguard. The Gertrud (ex Maud Hartman) was built in 1881, was 79m long by 11m wide and was 1691 tons gross. Possible position 58 41 73N, 03 07 40W. The Gertrud ashore on Stroma.